Since the age of three, when my father built a small pond at our home in Streatham, I have had an interest in ponds and aquatic life especially the microscopic life. 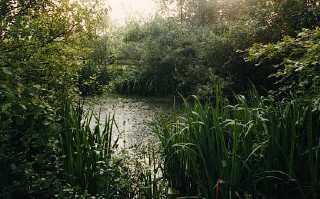 Since retirement in the early '90s I have created a number of ponds of various sizes in our wild garden and this page is devoted to an account of the problems encountered and to be a focus for other like-minded people in and around Horndean. I gained inspiration from the picture on page 30 of Chris Baines book on making a wildlife garden, where relaxation is the watchword, it hasn't quite worked out that way, but fiddling around with water and rocks and observing all the creatures that visit the pond is a very relaxing occupation indeed. Apart from numerous garden ponds there is a good selection of ponds throughout the parish, mostly public and accessible. These ponds are described here. I would love to hear of any I have missed or about your own garden pond. This page has an exchange section where local 'ponders' can trade their surplus aquatic plants and animals. On the left is my first pond, built by my father in 1937 at our family home in Streatham. In the middle is our 'wildlife' garden with maturing pond, photographed on Dufaycolour on a Sybil 120 film camera before there was Kodachrome. 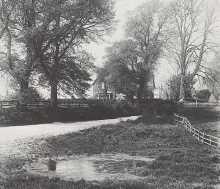 On the right our 'wildlife' pond in Horndean as it was about 10 years ago, now re-lined. 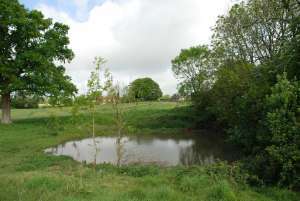 Some pond surveys were carried out between 2002 and 2004 but these were not complete and there is little detailed knowledge and the parish is very keen to restart a pond survey. Volunteers required for both carrying out surveys and conservation management particularly of the ponds described below in the next section. A few years ago Southern Water sponsored a Pond Warden Scheme in conjunction with BTCV. 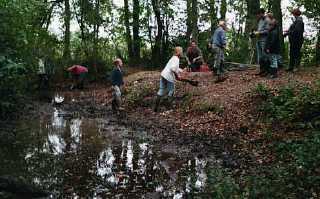 Hampshire Wildlife Trust also ran training days for pond surveying but things have gone quiet at the moment. The best active source of information on surveys and training sessions is the National Pond Monitoring Service and the Ponds Conservation Trust who are producing a National Pond Database. I did attend one of their field meetings in the New Forest. A very good day but I was a little bit out of my depth (literally ! ), If you would like to know more visit the web site www.pondnetwork.org.uk and download their newsletter. At a more modest level you can join the Parish rangers for Pond Dipping at Catherington Pond on either Thurs. 26th July or Wed. 29th August 2007 starting at 10am. For more details or offers to help with the maintenance or surveys - ring 02392 597766 (Horndean Parish Council). meanwhile I have made an illustrated list with a few details of ponds within the Parish of Horndean. Most of these ponds have an interesting fauna and flora but they await a more in depth survey to establish their biodiversity value and almost all need some tender loving care - how about it ? MR SU 6995 1285 - In the grounds of the house that was once the home of Admiral Sir Charles Napier, now Horndean Community Association, good for wildlife with platform for pond dipping seen in picture. 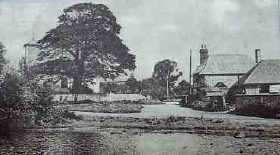 MR SU 7164 1355 - Just south of the old site of St.Giles, demolished in the 1950's, but seen in the old postcard. Was suffering from pollution (from farmyard opposite) but recently cleaned up, and has some alder trees growing on one side, no longer the village pond. MR SU 6882 1302 A group of three ponds, on north side of copse, ancient and natural part of woodland. Toad spawn often seen in spring. Now maintained by the parish council and the picture shows some volunteers having a clean up, and some of the surrounding trees have been removed to let in more light. Adjacent is a mossy ancient wood bank. Water levels vary particularly with weather extremes. The former ranger, Kevin Cloud can be seen sitting in the background overseeing the operation. For more pictures and information click on Dell Piece West. MR 6945 1243. Reached via Oak Coppice off Bull's Copse Lane. Now fenced and semi-private. Ancient part of the original copse but now surrounded by housing. Famous for newts including Grt Crested Newt ten years ago. Bordered by oak, willow and some fine aspens. Photo taken about 1990. MR SU 7135 1225. 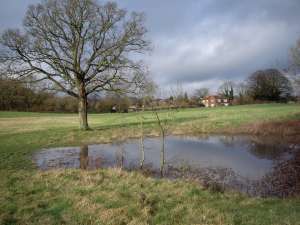 A medium size permanent pond beside the footpath leading to the Holt. 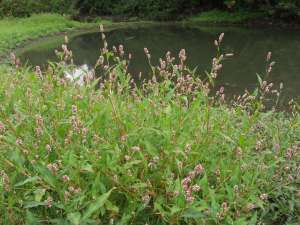 These pictures were taken on 14th August 2006 with a good crop of Persicaria on the south side and again on 10th Feb 2007 with a rather stormy sky. There is frequent flooding in the adjacent field. The north side has a background of willow and shrubs. Occasional visited by ducks. This pond suffers from rapid changes in level as seen in these two pictures. The first picture was taken after the period of hot dry weather on the 7th May - almost completely dry with serious cracks appearing. The second picture was taken only 5 days later on 12th May, back to its normal level. Hopefully the pondlife will adjust to these rapid changes and the water will not be draining through the new cracks that have appeared in the mud. MR SU 7056 1270. A large pond, keeps high level even during drought. Has ducks on and some water lilies, surrounded by mainly oaks. Adjacent to Keydall Garden centre. Access not encouraged. MR SU 680 142. Pond on private land but visible from the road, needs more investigation. MR SU 7058 1212. 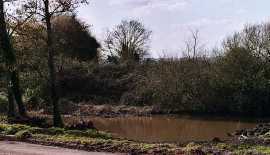 Remains of ponds which, before the motoway, probably have linked to the Hazleton Common pond. Can be found at the south end of the woodland along the Sheepwash Lane. 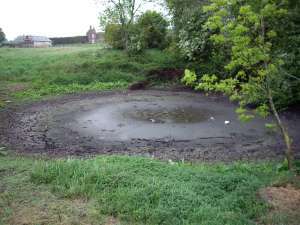 There are a number of other smaller or temporary ponds such as along Lovedean Lane MR SU 6838 1345 and of course, numerous garden ponds such as south of Parsonage field, Catherington (private) and I would like to hear news from viewers that know of any others that are managed with wildlife in mind. (Location will not be put on the website. A number of good pamphlets are produced by BTCV and the Wildlife Trusts on Pond Conservation, management and construction. There is more information on our Wildlife garden Page. Two useful handbooks for identifying Aquatic Life are Collins Field Guide to Freshwater Life and Small Freshwater Creatures - an Oxford NH Pocket Guide with superb illustrations.